When I was a child, I was so excited for Christmas morning that I'd sleep on my brother’s bedroom floor. I’d keep him up into the wee hours of the morning, talking about what gifts we thought we'd get. Finally, I’d have mercy and let him catch a few hours of sleep, only to wake him up at the break of dawn. But looking back, I can only name a few presents I opened on Christmas morning; instead, I remember the traditions my family created over the years, the laughter, and the love. There is seriously no better time to read the Christmas story than on Christmas morning. Nothing helps you focus on Jesus throughout your celebration more than reading the Christmas story first thing in the morning. When you read it is up to you! Maybe you want to tell the story before the kids get out of bed (Warning: you’ll have to get up pretty early for that!). Perhaps you want to read it around the Christmas tree. Maybe you even decided to read it during or right after breakfast. It’s up to your family to make the tradition work for you! Find what works best to make the story engaging and to center your hearts on the Lord. If we’re not careful, Christmas can quickly become a time of getting instead of giving. Let’s counter this by practicing outrageous generosity this Christmas. Volunteer your time, serve at church, or donate gifts to families in need. One way to continue this generosity until Christmas day is to have your family play Santa for someone else. Pick a neighbor and pay attention to something they want or need. Buy the gift, and put it on their doorstep anonymously. It could be something small like a gift card to their favorite restaurant or something big, like a new a dryer! Whatever you decide, place it sneakily on their doorstep before you open your gifts. This way, giving comes before receiving. Growing up, my family had one rule: we had to take pictures before we could open presents. It was this painful, drawn-out process that lasted for hours…through the eyes of a kid. In reality, it was a 45-second event that appeased my mother and gave me access to the presents. Now that I’m on the mother-side of this equation, I see the brilliance in my mom’s madness. She wanted to make sure she got a picture of her kids before the craziness of new toys took their focus away. Plus, a tree with presents underneath is a way better backdrop than wrapping paper littered on the floor. 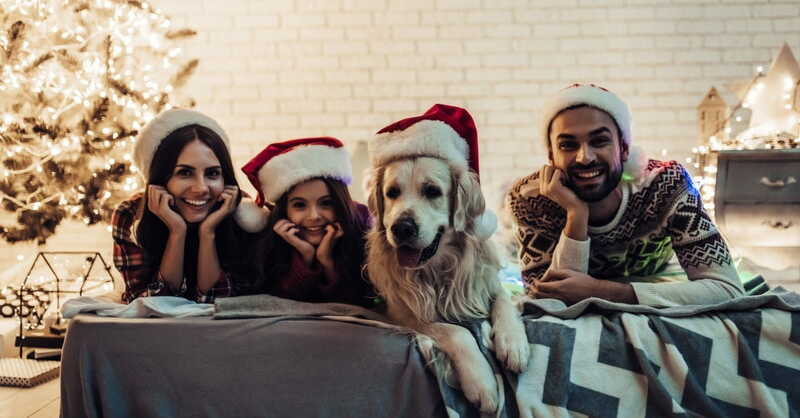 And while you may be weighing the pros and cons of postponing presents for a minute longer, I guarantee you won’t regret having a few staged photos of your family every year on Christmas, especially if matching PJs are involved. One great tradition to incorporate into your Christmas morning is to have a homemade ornament exchange. Gather your family and have each person’s name in a hat. Each person secretly draws a name and is challenged with creating an ornament for the person they picked. It can be made out of anything: clay, cardboard, bottle caps! Anything that helps get the creative juices flowing. Exchange the ornaments on Christmas morning and let each person find a super special place on the tree to hang it. Pro tip: make sure you mark who made each ornament, who it was for, and the year it was created. Trust me—these gifts will be cherished for a lifetime. Instead of putting the present in question under the tree, hide it somewhere. Then put an envelope with a clue inside on a branch of the tree. Have that clue lead to another clue that leads to another clue and so on and so forth. You can keep this going for however long you decide, and you can make clues friendly for all ages! This scavenger mixes up the standard present opening routine. It builds anticipation for the big gift, similar to the anticipation leading up to the arrival of Jesus. Plus, it’s a fun family activity that’s sure to create memories! All the lifestyle magazines out there always talk about the ways you can make your Christmas dinner amazing. But the real MVP of Christmas day meals is breakfast. Think about it—Christmas morning is one of the most glorious moments of the year. It’s overflowing with love and joy. Why not keep the celebration going with the most fantastic breakfast you’ll eat all year? Pancakes, French toast, eggs benedict, cinnamon rolls, hash browns ... Have a feast! Maybe you have casseroles made the night before so you can get breakfast going ASAP. Or perhaps you have all-hands-on-deck in the kitchen, making breakfast together while singing your favorite Christmas carols. It doesn’t matter what you eat. All that matters is you’re making memories with those you love. Since Jesus’ birth is the reason for the season, what better way to celebrate than by having a birthday cake—candles included! Okay, okay. Maybe eating slices of cake in the morning is a little bit crazy (although, let the record show that I highly recommend it). But choosing to celebrate Jesus with a birthday cake is an excellent reminder of the birth of our Savior, even if it’s post-dinner. I completely understand if you want to skip the cake because your day is already jammed-packed with sweet treats. Other birthday celebrations could be creating birthday cards for Jesus, thanking him for all your blessings, or even just singing “Happy Birthday” before breakfast! While there may be battery-operated gizmos and gadgets abounding on Christmas morning, take time to play some good old fashioned board games with your family. You could choose to play the same game every year or mix it up; in fact, you could make a tradition of placing a new family game under the tree to unwrap. It doesn’t matter which game, as long as you’re connecting and spending time with those you love the most. And while the kids may be more excited about their brand new animatronic smart pet, I guarantee the things they will remember is the quality time spent as a family, gizmos, and gadgets aside. Welcome to your family’s new favorite tradition. First, you must have exceptional mugs! It could be Christmas mugs or a favorite year-round mug. Think snowman, penguin, or marshmallow mugs. You could even give them as a gift every year! Next, you’ll need hot chocolate. You can have varieties or just stick to the original. While I’m a fan of plain old chocolate, you could experiment with gingerbread, s’mores, salted caramel, or hazelnut flavors. But, hands down, the most crucial part of a hot cocoa bar is the fun extras! Try peppermint or cinnamon sticks for stirrers. Have multiple flavors of marshmallows: vanilla, gingerbread, peppermint. You could even have whipped cream! Then top it off with sprinkles, crushed peppermint, or coconut. Talk about a delicious option for Christmas morning! The odds are high that all these Christmas activities will leave you exhausted by mid-morning. It’s the perfect time to grab your cup of hot cocoa and relax on the couch. Turn on your favorite Christmas movies and veg-out in front of the TV. Watching Christmas movies not only keeps you in the holiday spirit, but it also gives you a perfect cover for taking a nap. If you (or hopefully your kiddos) snooze during the movie, no one will be the wiser. If you have Christmas stamina like Buddy the elf, a movie is also a perfect time to play around with your new gifts. Or maybe the film serves as the perfect distraction for you to sneak into the kitchen and get started on dinner prep. Whatever your need, a Christmas movie helps create a time to fulfill it. Lindsey Brady is a brand-new wife and stepmother who loves to spend time in nature or going for long runs. When she's feeling a bit more sedentary, she'll watch an entire season of any Food Network show in a single sitting. You can follow her on Instagram at real.slim.brady.